I’ve got Day 4 for you here. Another short post. Not uneventful but not a favorite. By now, you may have notice that we have gone a bit out of our direct way to Pennsylvania. 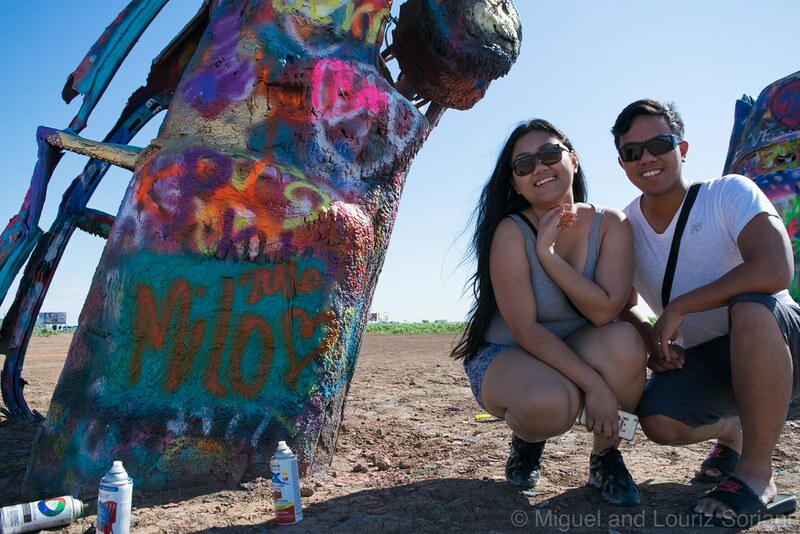 We only swung by Amarillo, Texas was a) Miguel loves Texas, b) Cadillac Ranch. 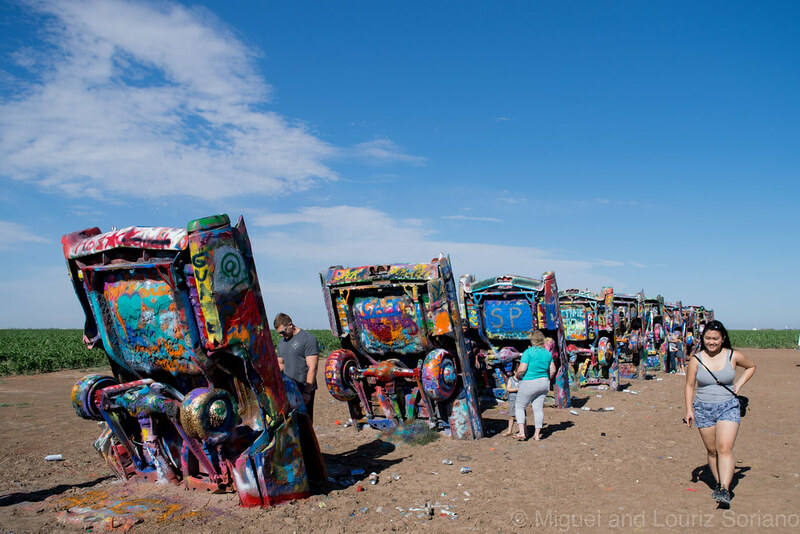 Like most works of art, this one, Cadillac Ranch is a must-see in person. I think it’s fantastic and says so much. It means different things to different people and I think that’s pretty kewl. Miguel and I both enjoyed it. I’ll leave it at that, take it to mean however you want. 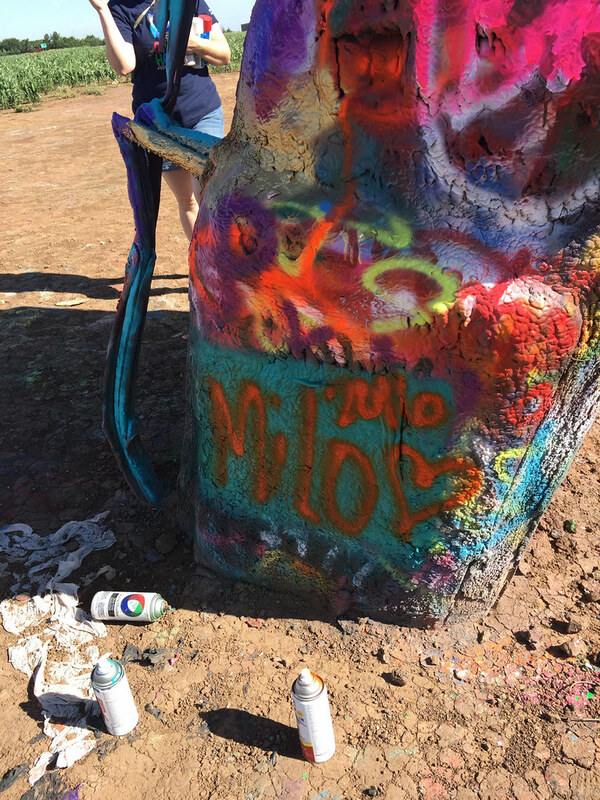 Personally, it made me feel a little bubbly which I could blame on either the abundance of neon colors or the paint fumes itself (you could smell the paint from 200 yards away). 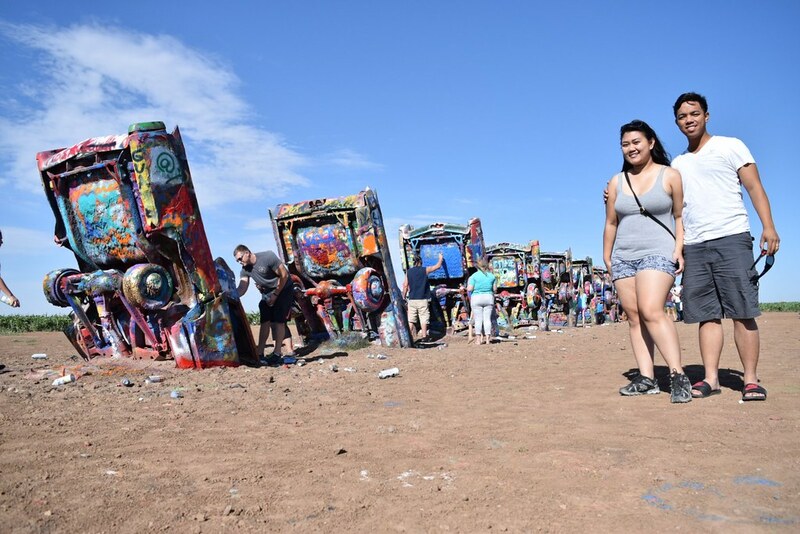 Again, if you’re ever near Amarillo, TX – definitely go see it. We didn’t need to buy our own cans of spray paint. As we approached the site, the people who were leaving handed us their leftovers. We made our mark as evidenced below, which for sure was gone within the hour. Life is fleeting friends. Fleeting. Back on the road. 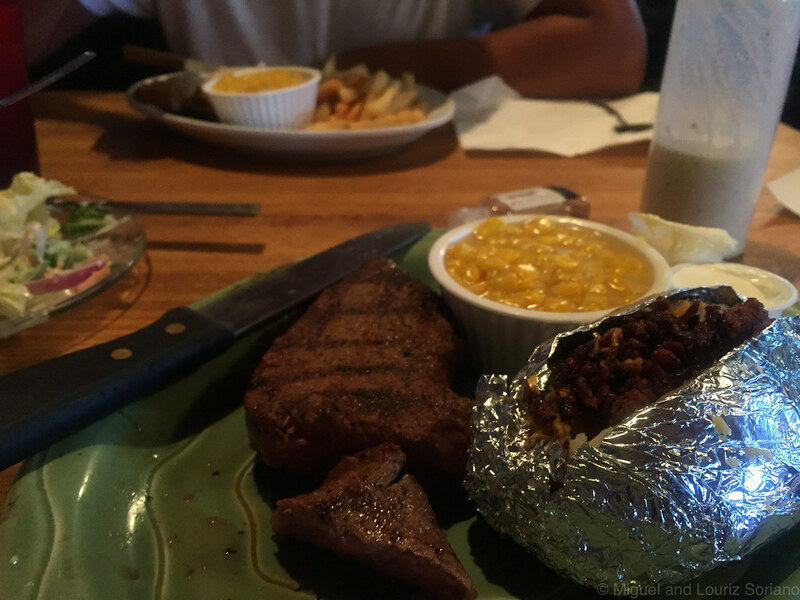 Now, if I ever see you in person, I’ll tell you about that time we were turned-away at a restaurant in the middle-of-nowhere Oklahoma. I don’t want to put that off-putting experience into actual writing and have it forever associated in my head with the state. I still intend to go back there and experience OK with a clean slate. So we’ll skip that. Forty-five minutes later after we enter Oklahoma, we exited it and entered Kansas. We had our late lunch at Liberal, KS. 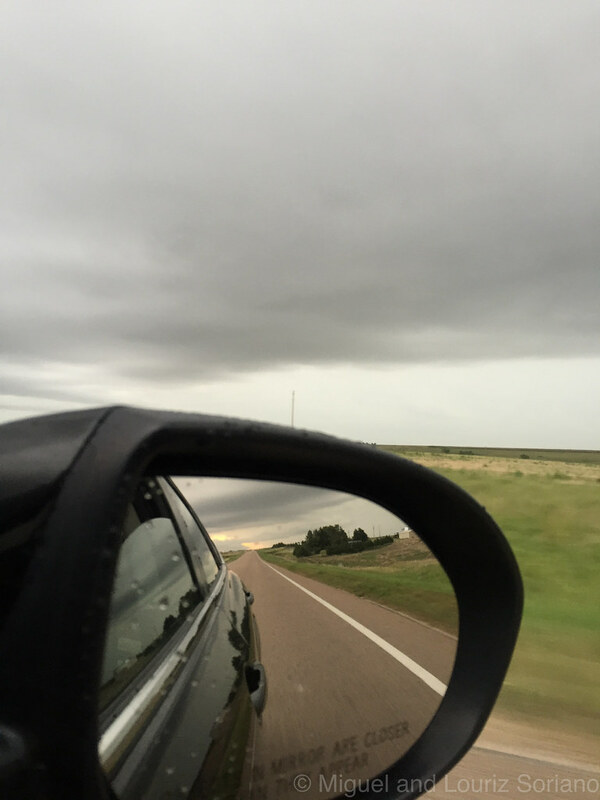 Then headed north towards Monument, KS because I really wanted to see Monument Rock. We didn’t get to Monument. 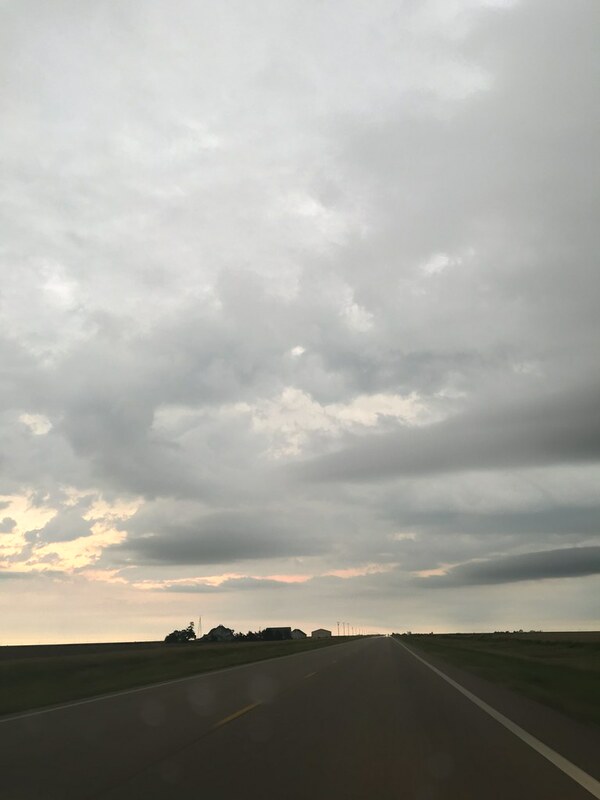 About 30 miles outside of Scott City, it became very apparent that there was a gigantic storm looming ahead of us. Now, I don’t know if it was living in California for too long that made me overly confident or maybe it was just sheer youthful nerve but I insisted on going ahead anyway. Towards the dark cloud of storm. I was not persuaded to turn back by Miguel’s rational pleas or even by the storm warning on the radio. Even seeing all the cars headed the opposite way did not deter me. I have my moments. We reached the edge of Scott City and boom! Torrential rain. Crazy, heavy wind. Wind that was threatening ti throw us off the road. We had to get out of the open. We drove into the first gas station we see (there weren’t other covered areas). The torrential rain turned into a hail storm. Within minutes the gas station was packed with about 10 other cars trying to get into cover. It was that bad. We texted family to pray for us. We ourselves were praying out loud in the car while holding each other’s hand so tight. I was crying and telling God, “I’m ready to die Lord but I was really hoping it wouldn’t be in gas station in the middle of Kansas.” And, “I’m so sorry I was so stubborn God!” I was serious too. This was prime tornado country you guys. We’ve seen the Wizard of Oz. We were only stuck in the gas station for about 30 minutes but it was a very long 30 minutes. God heard us. The storm subsided for a moment when a small clearing in the clouds opened up and we pulled out of Scott City and just rushed out of there. That sliver of golden sunshine… it was the most beautiful sky I had ever seen. As he drove, Miguel said, “That’s it. We’re driving east, as fast as possible for as long as possible.” We did. We literally tried to outrun the storm. It turns out, “as long as possible” meant only 2 hours. We didn’t want to drive at night in case there was another storm so we rented a room in Great Bend, KS. The motel we stayed at – will remain unnamed. It was horrible. It was cheap, next to a drinking place and we were there on a Friday night. Bad combination. There was a lot of unseemly activity going on. Also, our door opened to a public corridor and we had to park our car in what was basically a public lot. It’s not even cause we were trying to be priggish, after all, we just came from Sepulveda Blvd, in the San Fernando Valley. We would have been okay but keep in mind that our car was full with valuables, including a flat screen (covered with only a blanket) in the back seat. It was out in the open. Anybody could tell that the car was packed. Not kewl. Not a situation you would like to be in. But God was and is always with us.